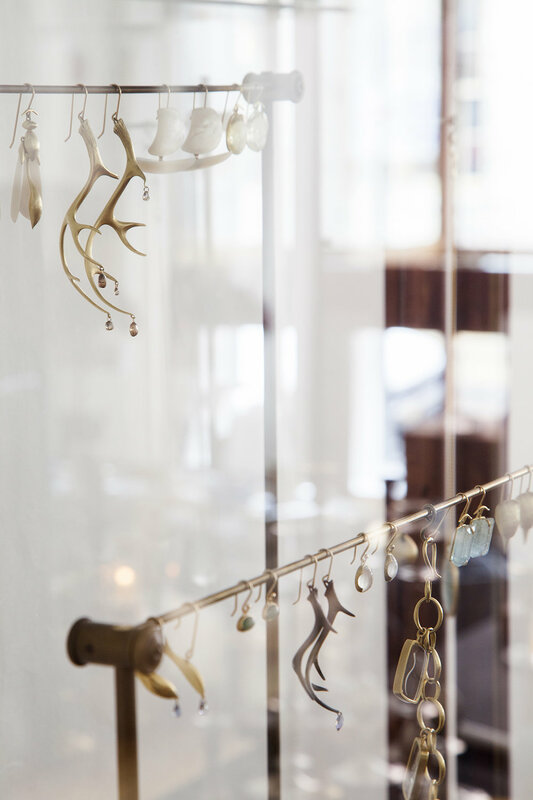 FOUNDED IN 2008, EGAN DAY FINE JEWELRY IS A THOUGHTFUL, LOW-KEY LUXURY OASIS. TUCKED INSIDE A CIVIL-WAR ERA BROWNSTONE AT JUST ABOVE-EYE-LEVEL, EACH DAY BEGINS IN A NEW FASHION WITH THOUGHTFUL EDITING OF THE SPACE. DAILY CHANGING VIGNETTES ARE PULLED FROM THE NATURAL SHAPES OF EVERY PIECE OF METAL AND WOOD ON THE BDDW FURNISHINGS, SEMI-PRECIOUS GEMSTONES AND OBJECTS; OFTEN IMPRESSED BY THE CHANGING SEASONS IN BOTH FLORAL AND GEOLOGICAL FORMS. THE SPACE EVOKES THE LOOK AND FEEL OF “TAKING A WALK IN A GARDEN”, AND IT IS WITH THIS SENTIMENT THAT EGAN DAY ATTRACTS A CLIENTELE THAT IS LOOKING FOR A MEASURE OF HIGHLY PERSONAL INSPIRATION. OUR GOAL IS TO GIVE OUR CLIENTS THE SATISFACTION THAT COMES FROM GIVING OR WEARING AN EXQUISITE PIECE OF JEWELRY. EGAN DAY PROMISES PRESSURE-FREE SHOPPING AND ENDS-OF-THE- EARTH CUSTOMER SERVICE.